The rise of the right-wing Alternative for Germany (AfD) party in the German Federal elections, the unrest following the Catalan referendum and the inertia in the UK's Brexit negotiations suggest that political risks may be rising in Europe. In October's Austrian elections, the far right Freedom party won 26.9% of the votes, its strongest results in two decades. There is a possibility that the party could join the next government as a junior coalition partner. The Italian general election in Spring 2018 is likely to become the next major European political event to attract investors' attention. What to expect from the Italian elections? 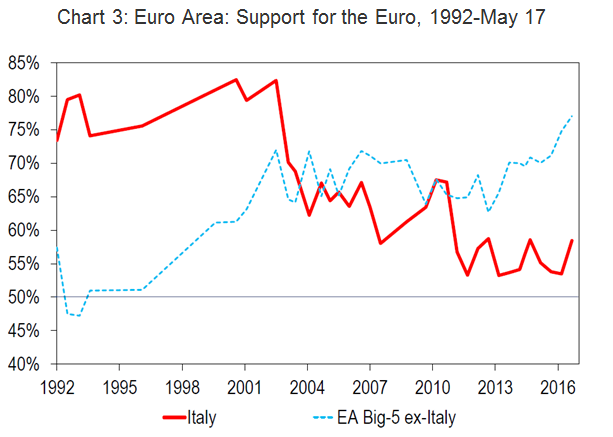 Italy's anti-EU/anti-euro sentiment is among the strongest in the EU and unlike other countries within the region, it is not reducing. See Chart 3. However, Citi analysts note that populist parties in Italy have softened their most extreme positions demanding an EU referendum, aware that deals with mainstream parties are inevitable if they want to get into power. Citi retains the base case scenario of Italian party Five Star Movement (M5S) coming first in the election and attempting to form a government with parties (or portions of parties) from the left of the political spectrum. Citi does not expect a single party/coalition to win an absolute majority in the election. Coalition building will likely be complex and potentially involve further parties splintering. However, the likelihood of another election in 2018 is low. The next Italian government is unlikely to make much progress on the reform agenda and on fiscal consolidation, but the ongoing cyclical recovery may help Italy to continue economically struggling through. In Citi's view, it will likely take the next economic recession for Italy to seriously return to its reform agenda. Moody's negative outlook on Italy (Baa2 negative) reflects the diminished likelihood that the Italian government will make meaningful additional progress on structural economic and fiscal reforms. But with growth surprising to the upside, Citi analysts expect no change in the rating for now. How will Italy's political uncertainty affect the euro? Despite the cyclical recovery in Italy, several key economic indicators are still lagging below 2008 levels. 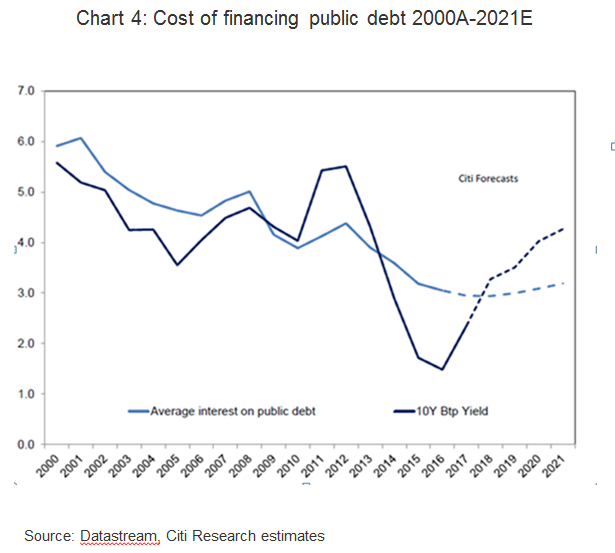 Public debt remains stubbornly high (See Chart 4), which could put the long-term sustainability of Italy and possibly the euro at risk. However, Italy's cyclical recovery may prevent the fiscal deficit from widening dramatically from the current 2% of GDP. Slightly higher nominal GDP growth can also help to stabilize the public debt ratio. Between European and US bond yields may slow bond portfolio outflows from the Eurozone, thereby supporting the euro. Citi analysts remain positive on European equities. The cyclical recovery in the Eurozone is broadening across sectors and countries. Citi has recently raised its above-consensus GDP growth forecasts for the Eurozone to 2.3% in 2017 and 2.1% in 2018, due to faster growth estimates for both France and Italy. The DJ Stoxx 600 is still attractively priced on a relative basis at 15x 2018 forward price to earnings ratio and corporate earnings are expected to grow 8.8% in 2018. Europe's dividend yield of 3.2% is also attractive and expected to remain the highest among the regional equity markets in 2018. High dividends can provide a buffer against equity market volatility in the months ahead. The common thread running through the political uncertainty in Europe appears to be a chronic leadership vacuum. The political elite across Europe is perceived to be either out of touch with the electorate or unable and/or unwilling to champion and drive through reform. Moreover, there is a growing divide between the reform that is being demanded by the electorate and what is needed for sustainable future growth. In recent years, financial markets have continued to rise looking beyond significant political changes. Citi analysts believe this is because the connection between political events to their real impact on the economy are often unclear and have been cushioned by large quantitative easing programs. In the current round of political events, potentially negative economic impacts are becoming easier to envisage. Opposition to reforms in Germany, headwinds to the Franco-German alliance and a possible fragmentation of Italy – Europe's fourth largest economy – are meaningful risks against the backdrop of the Euro, which has strengthened sharply this year. Threats to fiscal control and to financial conditions are also potential risks for bond investors. And the possibility of the UK breaking its ties with the Euroland, which makes up over half of its trade is already having ramifications on the Pounds (GBP), UK inflation and the UK domestic economy. While Citi analysts continue to expect positive returns from European equities over the next six to nine months, Citi remains watchful on the longer term outlook for the Eurozone. The unexpected outcome from the German and Austrian elections, the unrest following the Catalan referendum and the inertia in the UK's Brexit are indicators that political risks may be rising in Europe. The next Italian government is unlikely to make much progress on the reform agenda and on fiscal consolidation, but its ongoing economic cyclical recovery may help Italy to continue struggling through.